As I started reading more about vegetable gardens, especially urban gardens, I began to see the link between gardening, food security and poverty. Even in the US, many families struggle to eat healthy because packaged foods are more readily available in urban settings and often are more costly. But, the negative side effects of the lifestyle and eating habits which have resulted are plaguing the US population with health issues such as obesity, diabetes, high blood pressure and so forth. We all know we should eat more fruits and vegetables, but the modern city lifestyle simple isn’t conducive to it. As people are increasingly realizing this link, more and more people have begun to start urban gardens to increase their ability to easily integrate fresh produce into their diets. For urban apartment or condo dwellers, the garden may be a few plants in containers. For urban or suburban home owners or dwellers, they may have room for a small in-ground or raised bed garden. Some lucky urban residents may have access to a community garden where they usually have more area to work with in collaboration with a group of other urban gardeners. The Dinner Garden is a non-profit focused on increasing the trend of people to grow their own fruits and vegetables, even in small areas. They distribute seeds for free to families and school children in an effort to encourage gardening and increase food security for families across the US. As any teacher or parent knows, eating fruits and vegetables is extremely important for children’s development and studies show that it can improve energy and brain function. By getting kids involved with gardening at a young age, it can help promote healthy habits that can last a lifetime. The Dinner Garden has accomplished so much since their beginning in 2009 and the work they are doing is amazing. Check out their website or read some other blogs which feature this organization. Posted on January 31, 2011 June 14, 2011 by JoannePosted in agriculture, Education, Food & Drink, fruit, garden, Health, Nature, Plants, vegetablesTagged Dinner Garden, food security, free seeds, garden, Health, urban garden, vegetable garden. 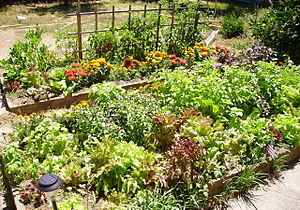 Previous Previous post: High food prices in 2010 – Grow your own veggies!